Gross Profit Margin measures how much of each dollar in sales is left as profit after accounting for the cost of goods sold. This KPI is a good indicator of a company’s financial viability as it highlights whether it can pay off its expenses and still collect revenues from every sale. Gross profit margins tend to be relatively stable barring any major changes in production costs or processes. In financial analytics, understanding profitability is vital as it can be the difference between growth and bankruptcy. Gross profit margin analysis can reveal areas where costs must be reduced or highlight products and services that may not be profitable. For instance, a product that has a gross profit margin of 5% may not be as viable as one that has a gross profit margin of 30% and may result in smaller revenues and stunted growth. To measure gross profit margin, you need to know your revenues and the cost of goods sold (COGS). To find the margin, subtract COGS from your revenues, and divide the result by the revenues. Then, divide the final number by 100. For example, a company with revenues equal $500,000 and a COGS of $420,000 would have a gross profit margin of 16%. 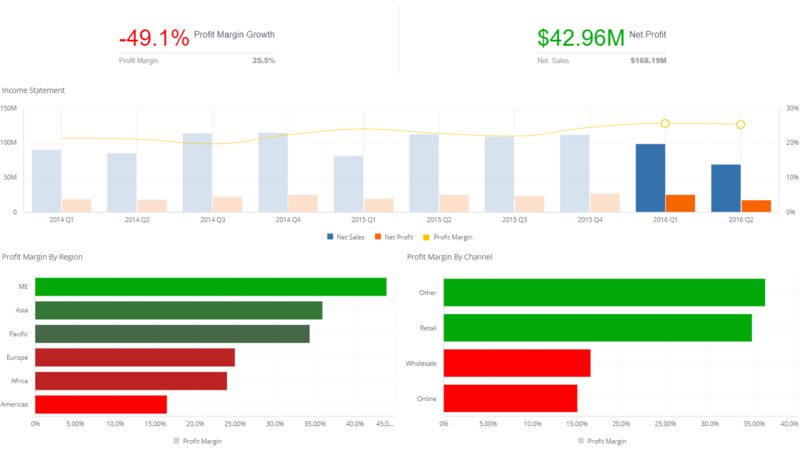 A gross profit margin analysis would include data from sale dashboards, as well as manufacturing or input costs. Moreover, it would include monthly, quarterly, or yearly data regarding revenues, depending on your desired measuring period. Let’s say you have two products on the market, and both are selling in relatively similar quantities. However, your margins and overall profits remain lower than anticipated despite the strong sales. Studying your gross profit margins can indicate the need to reduce production costs or to increase prices to optimize margins. Moreover, it can help focus on products and services that are cheaper to produce and can sell for better value. This way, you can prioritize those aspects of the business that produce the best results and reinvest funds into growth. What Benchmarks/Indicators Should I Use?